Car parking revenue is a major source of income for most airports and is often the highest income source not directly related to aircraft operations. 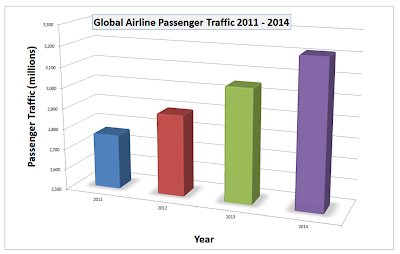 The increase in global airline passengers shown by World Bank data suggests an increased demand for airport parking. But, what happens when travelers, visitors and employees encounter parking problems? Some of the possible consequences are described below. The ease with which airport parking customers can locate open parking spaces close to the terminal directly relates to their satisfaction. Parking customers, however, are often unaware of parking shortages until arriving at the airport. This leads to stress, frustration and the potential of missing flights. If parking shortages occur regularly, airports risk losing parking revenue when customers switch to using private parking facilities, different modes of transport such as buses, trains or being dropped off and picked up by family or friends. Moreover, getting customers to return to using airport parking once they have switched to other options is never easy. Travelers going from one parking lot to another in search of parking spaces increase the volume of traffic on airport roadways. However, even when travelers choose not to park at airports, the potential for traffic congestion on airport property and surrounding roadways can increase substantially. The number of vehicle trips to airports and on surrounding roads can more than double when travelers switch from parking at the airport to being dropped off and picked up by family or friends. When travelers park at airports, they make one trip. They drive in once, park and leave once. However, cars drive in and leave once when dropping off travelers then they drive in and leave a second time for the pickup. In the common situation where returning travelers are delayed, pickup vehicles often circle airport roadways, find free places to stand, idle and wait or drive to and from remote areas waiting for a phone call from the arrived traveler ("cell phone parking area"). In such cases, the travelers' shift away from airport parking increases traffic congestion and auto emissions while generating no parking revenue for the airports. While the primary focus of airport parking is generating revenue from travelers and visitors, airport employees must not be overlooked. Employees working directly for airports and those working for airlines and airport vendors and service providers need reasonable commuting access to their workplaces. Access may be via public transport or by driving and parking at the airport. A lack of convenient and affordable parking for airport employees can make it more difficult and costly to retain employees, especially those who are temporary or part time. Poor airport parking situations may have some positive benefits. For example, if poor parking gets more travelers and employees to leave their cars at home and take mass transit to airports, that should be an overall benefit. However, studies show this rarely happens in meaningful volume and the airports still lose revenue. The better solution is to provide more parking spaces. This is done easily and cost-effectively with automated parking systems like those from Skyline Parking. Give us a call to find out how much added revenue you can generate by adding more parking spaces at your airport.